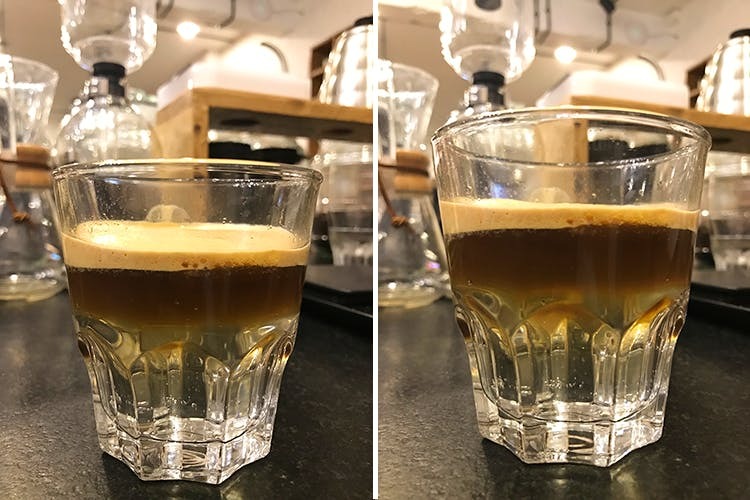 Spinning a different take on regular coffees, Third Wave Roastery in Koramangala serves an experimental coffee tonic drink. For coffee snobs of course. Those who love coffee and love experimenting with their favourite brew. The roastery has a very laidback and hipster vibe. I’d definitely recommend the balcony seating area if it is not too hot. Preferablyin the evening. The coffee tonic is an interesting and unusual take on regulr coffee. Fizzy tonic water is slowly poured on an espresso shot in a glass to create a head of froth. While the coffee tastes strong and its usual self, the tonic water adds a bit of a fizzy punch, and makes the coffee slightly salty. But in a good way. Ice is added to the drink too. This is ice coffee with a zing. We’d recommend the Middle Eastern egg dish Shakshuka with cheese to go along with the coffee. tonic. The servcie is always friendly here and the recommendations on the coffee front are always great. These guys will also sometimes fine tune your coffee just the way you like it. They have free WiFi to go along with your coffee.